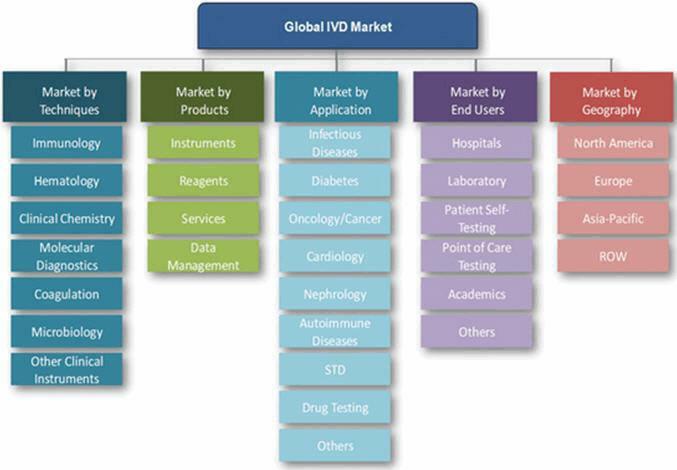 The in vitro diagnostics (IVD) market is commonly segmented by techniques, products, application, end users, and geography. Considering the scope and magnitude of this market, however, there are inevitable segment overlaps and relationships between segments that often become indistinct. In order to adeptly navigate the diagnostic market landscape, an overall understanding of the inter-segment relationships and intra-segment breakdowns is necessary; this is especially important when considering that market segmentation across diagnostic companies is not standardized and that inter-segment subcategories are oftentimes grouped together. The following diagram illustrates the common segmentation of the IVD market. The segment subcategories presented are non-exhaustive, but nonetheless provide a general understanding of the complexity of the market. Perhaps the most widely employed market segmentation by diagnostics companies is by technique and by application. Market segmentation by products and end users are also common; however, companies tend to specialize in only one particular subcategory within these segments. For instance, within the end users segment, there are companies that specialize specifically in point-of-care (POC) products and thus do not find it valuable to segment the market by end users. Given the close and intertwining connections between market techniques and applications, it is important to perform higher-level analysis of this relationship. The following table provides insight into the primary applications for each technique in the IVD market; certain techniques could be used for applications that are not indicated, but an unindicated application suggests that it is not the technique’s primary use and/or an alternative technique dominates that particular application. Diagnostic companies or reports may distinguish certain types of infectious disease as its own category depending on their particular focus or the magnitude of the disease; for instance, in the table above, HIV/AIDS (HIV is the virus that causes the AIDS infectious disease) is distinct to highlight its main use of immunology and molecular diagnostic techniques. Of the techniques, the most widely used is immunology and one of the fastest growing is molecular diagnostics;2 of the applications, perhaps the most widely encompassing is infectious diseases. The most common type of immunoassay is the enzyme linked immunosorbent assay (ELISA). This method uses fluorescently conjugated antibodies to give a visual indication when a target protein unique to a certain condition is detected in a sample. This is the most common technique used in central lab diagnostics, accounting for around 40% of the market share. Antibody detection is also the basis for all pregnancy tests, which account for around 90% of the patient self-testing market (source: Health advances). 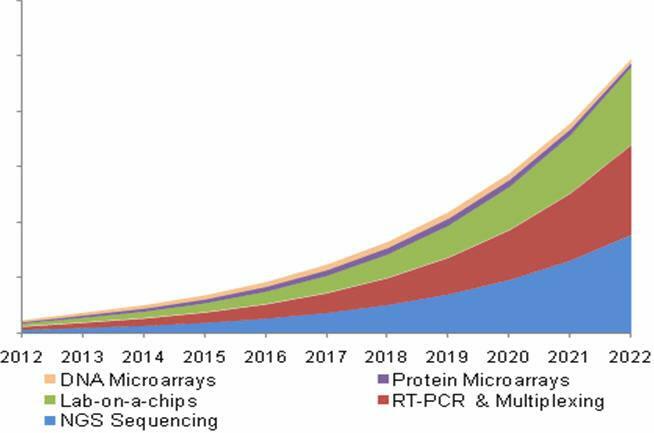 The molecular diagnostic technique further breaks down into three main promising technologies: lab-on-a-chip (LOC), real time polymerase chain reaction (RT-PCR) & multiplexing, and next generation sequencing (NGS). The infectious disease application, as previously stated, encompasses a wide range of diseases and is oftentimes broken down or regrouped depending on what a company or report is trying to convey. The figure below illustrates the prevalence of some of the most common infectious diseases. Additional common types of infectious disease include: flu, meningitis, pneumonia, tuberculosis, and RSV. Market segmentation by product includes the instrument systems that carry out a particular assay, and the set of reagents for an assay that work in conjunction with an instrument. Segmentation by end user is dominated by central laboratory and POC testing; each of these subcategories operate in distinct spheres of the diagnostic market with central lab focusing on high volume workflow automation, and POC testing focusing on fast turnaround times. 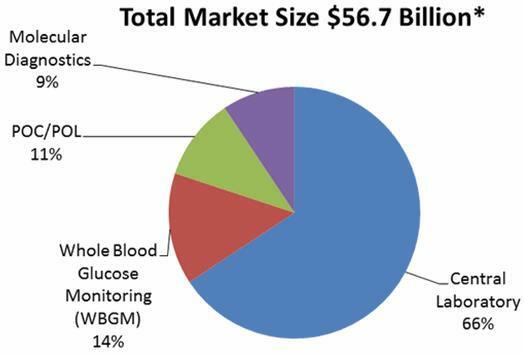 Here, IVD market segments by end user (central laboratory and POC), technique (molecular diagnostics), and application (glucose monitoring) are all included. Of course, such a division of the market is non-optimal due to the overlapping segments- molecular diagnostics could be included with either POC or central laboratories. With a better understanding of the market segment categorizations, however, we can clearly recognize relationships and differences, uncovering a clearer picture of the true scope and organization of the IVD market.